Damiani/Matsumoto Editions, Bologna, Italy, 2017. In English. 160 pp., 75 tritone illustrations, 10½x14". 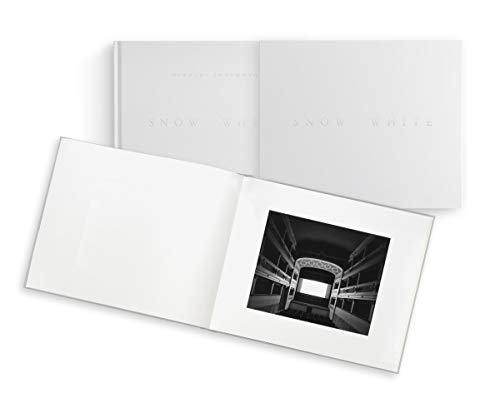 Published in an edition of 400 signed and numbered copies, Snow White is a unique collector’s edition book containing 75 artworks by Hiroshi Sugimoto (born 1948). All of the photographs in Snow White are from his Theaters series and include many of his well-known photographs of classic movie palaces and drive-ins, along with new photographs of Italian opera houses and abandoned theaters. Sugimoto began the Theaters series four decades ago. To make these images, he opens the shutter inside the dark theater (or in the case of the drive-ins, outside at night) for the duration of the movie. The running movie is the only source of light bringing out the architectural details of these spaces. The Disney movie Snow White was running when Sugimoto photographed Palace Theater, Gary (2015), one of the abandoned theaters that is reproduced here. In this book, Sugimoto reveals for the first time the movies that were screened when he took these photographs and the exposure time of each photograph. Each artwork in Snow White is accompanied by the name of the movie, its running time and a short text about each written by Sugimoto. The black-and-white photographs are hand-tipped onto the pages and the book is bound in silk cloth. Each copy contains a numbered colophon signed by Sugimoto. Trade Edition of 400 signed and numbered copies. Limited Edition of 25 copies. Includes an 11”x14” Silver gelatin print of Teatro dei Varii, Colle di Val d’Elsa, 2014, signed by the artist. Both the book and print are housed in a custom aluminum box. PLEASE NOTE there is a flat worldwide shipping rate from the publisher of $400.00 for the Limited Edition copies of Snow White.